Have been hearing many reviews about Din Tai Fung. Have been passing by Din Tai Fung many times. Have been seeing the restaurant fulled with customers during dinner time. Have been saying bye bye to this restaurant many times as I need to wait for 45minutes to get a seat. Today, I was with my friends in Mid Valley. I did not want to have another Hi-and-Bye waving to Din Tai Fung anymore. Din Tai Fung! Here we come! This was my second time having Din Tai Fung xiu long bao. Being the signature dish of the restaurant, no doubt it was nice. It is said that each xiu long bao has 18 folds to close the open to give a perfect hold so that the skin will not torn easily. Everything skillful but sadly I did not count on the folds as I’m more keen on consuming it..haha.The skin was smooth and thin but not easily torn.Me being a person who does not have good chopstick skill can easily take it up without tearing off the delicate skin. Many of them suggested to eat xiu long bao by stuffing the whole bun into your mouth. But I chose to had a small bite on the skin and thick meat soup started to leak out. I took a sip of it. Incredibly nice and soupy. 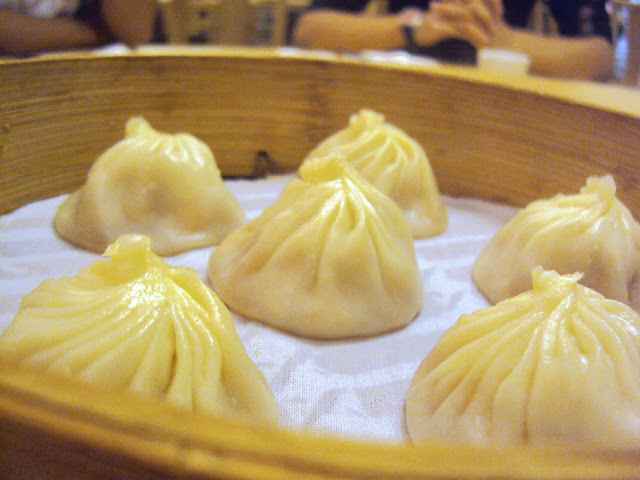 Many of them had been comparing the xiu long bao between Din Tai Fung’s and Dragon i ‘s one but I don’t want to make a judge this time as both of them were equally good. All I is just to come back again and again for the xiao long bao. It had the almost same taste as Xiao Long bao just that there was prawn in it. Meaty and soupy inside and smooth skin outside…it was nice but nothing special. Maybe because it was almost the same as Xiao Long bao so I didn’t get any surprise from the dumpling. The portion of la mian was quite small but the noodles was chewy and springy. The soup was alright and not oily. Quite a healthy clear soup. The pork chop was delicious. Flavouful and big in portion. However the pork chop lost its crispiness because it was soaked in soup. I would prefer the meat to be served seperately from the la mian to remain the crispiness and taste. The fried rice was OK but not as nice as I expected. The fried rice was loaded with egg, pork slices, shrimp mushroom and many other ingredients. Every grain of rice was fried to perfection but somehow it lacked of “wok hei” and not salty enough. I wished they added in more salt and fried more vigorously to flavor up the taste. Succulent shrimp loaded on the fried rice.